The eruption of Hawaii’s Kilauea volcano could last for months or years and threaten new communities on the Big Island, according to a report by U.S. government geologists. 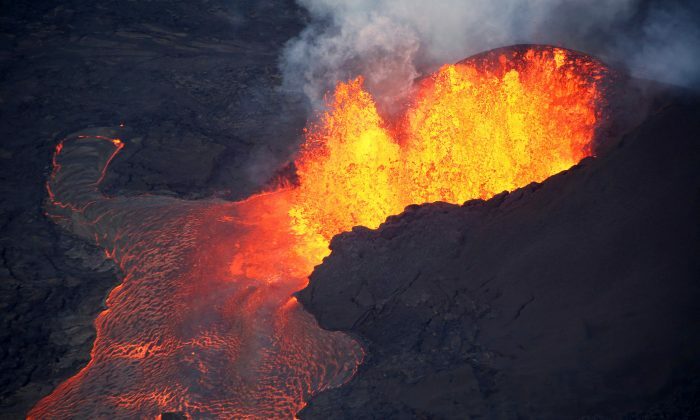 A higher volume of molten rock is flowing underground from Kilauea’s summit lava reservoir than in previous eruptions, with supply to a single giant crack—fissure 8—showing no sign of waning, according to the study published last week. “If the ongoing eruption maintains its current style of activity at a high eruption rate, then it may take months to a year or two to wind down,” said the report designed to help authorities on the Big Island deal with potential risks from the volcano. Lava is bursting from same area about 25 miles down Kilauea’s eastern side as it did in eruptions of 1840, 1955 and 1960, the report said. The longest of those eruptions was in 1955. It lasted 88 days, separated by pauses in activity. A 1,300-foot-wide lava river now flows to the ocean from this “source cone” through an elevated channel about 52 to 72 feet above ground.